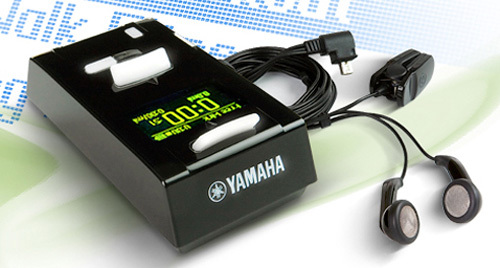 Yamaha BODiBEAT MP3 Player Syncs The Music To Your Workout | OhGizmo! Music can be a great motivator when exercising, but some songs are better suited for it than others. So while you can use any MP3 player when you head out for a jog, the BODiBEAT from Yamaha is designed to automatically select songs that best match your current activity using both a built-in accelerometer to keep track of your footsteps, as well as a heart-rate monitor that clips onto your ear. It has 4 different operating modes you can choose depending on what your goal or routine is. The Free Workout Mode will automatically choose songs that have a similar tempo to your walking or jogging speed. As you speed up or slow down, the player will select a different song that better matches your new pace. The Fitness Mode will try to provide the most appropriate music for an optimal aerobic exercise based on your heart rate. It will play faster songs if you’re moving too slowly or slower songs if you’re moving too quickly. The Training Mode is apparently designed for serious athletes, and it allows you to create structured exercise sessions with preset time intervals and specific targets for heart rate, running pace or song tempo. Finally there’s the standard Music Mode which will make the BODiBEAT function like any other MP3 player, playing music by artist, album or whatever you choose. The BODiBEAT is expected to be available in Winter 2008, but I’m not sure if that means the beginning of the year, or the end of the year.